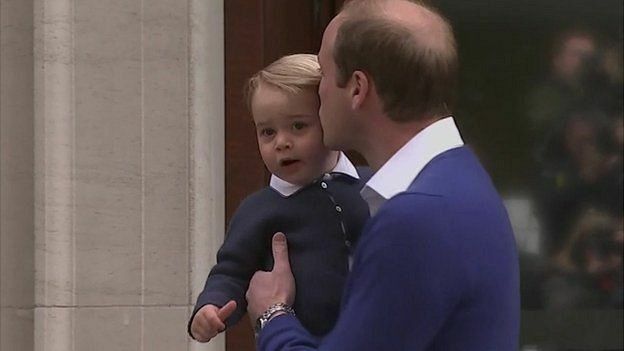 Prince George has visited his newborn sister at St Mary’s Hospital, in London. Prince William, who was present for the birth of the 8lbs 3oz (3.7kg) baby girl, brought his 21-month-old son to the hospital. The Duke of Cambridge told the waiting crowds the couple were “very happy”. It is the first time Prince George has been officially seen in public in the UK since he left the same hospital as a newborn in 2013. Kate Middleton has given birth to a girl at 08:34 BST, Kensington Palace has announced. The newborn princess is fourth in line to the throne. Both Kate Middleton and her daughter are “doing well”, Kensington Palace said. Prince Charles, who had earlier said he was hoping for a granddaughter, and his wife Camilla said they were “absolutely delighted”. Kate Middleton had been admitted to the private Lindo Wing at St Mary’s Hospital in Paddington, west London, at 06:00 BST. The newborn princess joins the line of succession behind her grandfather Prince Charles, father Prince William and brother Prince George, who was born at the same hospital in July 2013. The princess is Queen Elizabeth II’s fifth great-grandchild. Hundreds of well wishers have gathered outside St Mary’s Hospital to catch a first glimpse of the new princess. A large number of journalists, photographers and broadcasters had gathered after the announcement that Kate Middleton was in labor. Following the announcement of the birth, standing on the steps of the Lindo Wing, unofficial town crier Tony Appleton told crowds: “We welcome with humble duty the new baby of their Royal Highnesses the Duke and Duchess of Cambridge.